1. 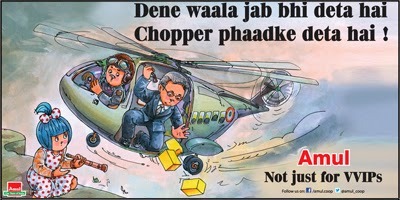 Amul's take on the bribery scam, popularly referred to as the 'Choppergate' in which several Indian politicians and military officials were accused of accepting bribes from a helicopter manufacturer. The controversy surrounded a US$550 million deal for the purchase of a new fleet of choppers meant for the use of Indian VVIPs. 2. The Chinese' troops intrusion into the Indian territory led to this witty advertisement. 3. The month of April 2013 saw the collapse of a ponzi scheme (popularly referred to as a chit fund scam) run by the Saradha Group. With investors' loss running into billions of rupees, this collapse led to a great political showdown in the state of West Bengal. 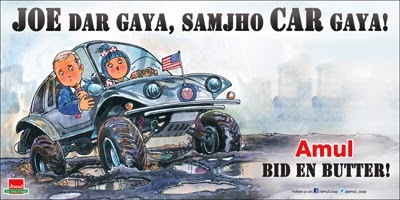 The following ad is Amul's take on the whole issue. 4. The IPL match-fixing scandal shocked cricket lovers in 2013. India captain Mahendra Singh Dhoni however refused to open his mouth on the issue. 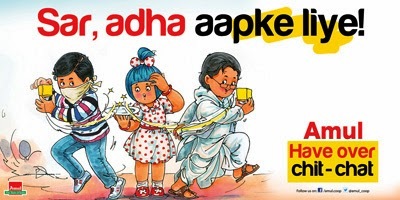 Here in this "Opens Mouths" advertisement we see Amul's humurous take on the issue. 5. In June 2013, a cloud burst caused devastating floods in the state of Uttrakhand. The Indian led the evacuation and rescue operations and saved thousands of lives. 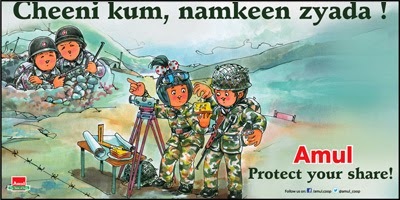 In this advertisement Amul pays respect to the Indian Army. Indeed India is in 'Good Hands'. 6. 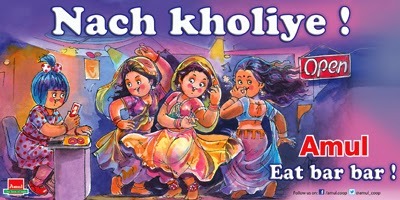 Amul celebrates the Supreme Court's decision to re-open dance bars in Mumbai in this "Nach Kholiye" advertisement. 7. U.S Vice President Joe Biden finding it difficult negotiating Mumbai's portholes. 8. The Month of August saw the world wake up to a funny story - England spinner Monty Panesar had allegedly urinated on the bouncers after being thrown out of a pub. 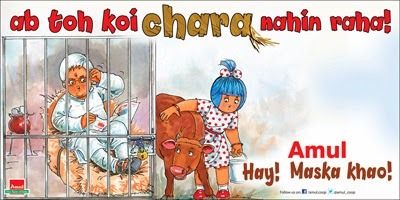 !Here is what Amul thought of the whole incident. 9. 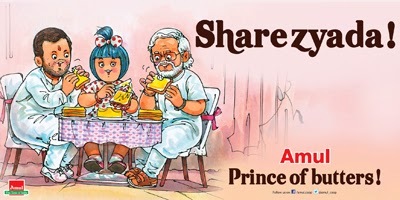 Amul's take on the controversy surrounding Narendra Modi referring to Congress Vice President Rahul Gandhi as "shahzada"
11. RJD leader Lalu Prasad was sentenced to five years imprisonment in a fodder (referred to as "chara" in Hindi) scam case. 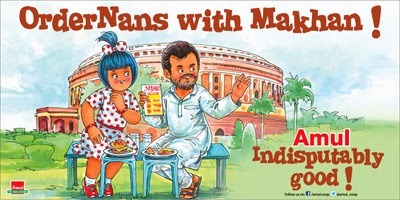 Amul was quick to bring out this "ab toh koi chara nahin raha*!' ad to mark the incident. * Means "now there is no way out"
12. 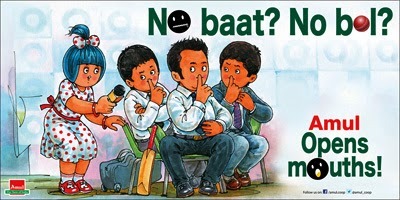 With Sachin playing his last test match, India rightfully "Retires Hurt"
13. 2013 saw the rise of the aam aadmi (common man) with the AAM Aadmi Party led by Arvind Kejriwal. The party won 28 seats in the Delhi assembly elections went on to extend 'outside' support to the Congress. 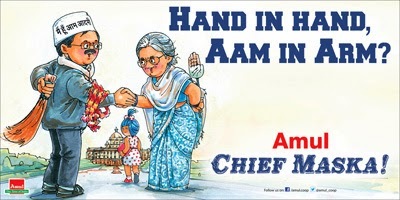 Amul was quick to come out with this "Aam In Arm" ad. 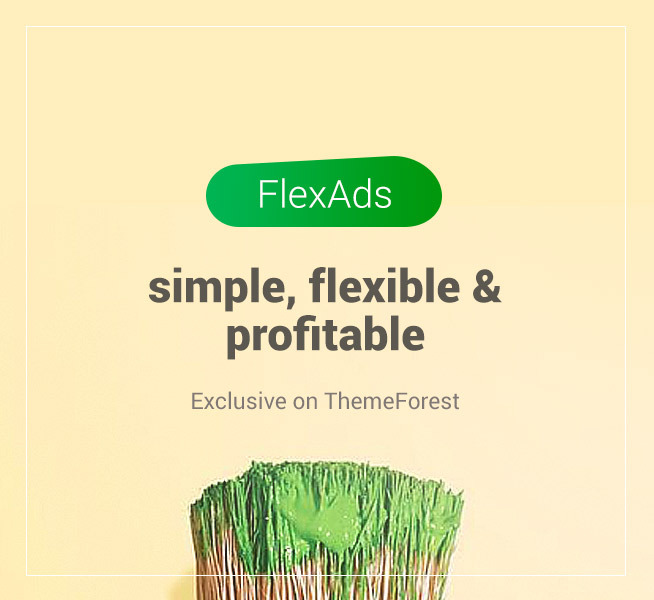 Hope you've loved our little feature.